"Where in the world did your kid learn THAT?" We get asked this question frequently when our 4-year-old starts pointing out Kazakhstan and Algeria on world maps. The truth is- well yeah, I taught her, but although I made teaching geography into a game around here, memory retained the knowledge way better than mine has. Girlfriend corrects ME when I mix up the order of Norway, Sweden and Finland. For real. Kids remember this stuff. It all started with this old placemat I'd had lying around the house since the beginning of time. As soon as our daughter moved out of her highchair, at about 2-years-old, I used this mat to serve her meals. Because kiddo gets a lil' whiny when she's waiting for Chef Ma to serve up the goods, I always give her Cheerios to tide her over while I'm cooking. 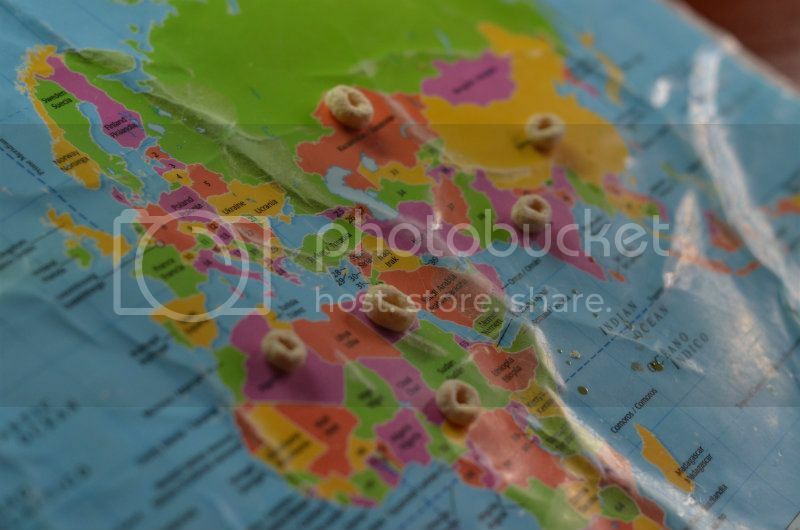 Place Cheerios on various countries and watch your kid EAT geography up! For fun, I began placing the Cheerios on different locations on the placemat world map. As she'd eat each Cheerio, I'd tell her the name of the "place" she'd just eaten. This kid LOVED the game! After I'd pronounce each location, I'd ask her to repeat it and point to the spot where she'd eaten the Cheerio to establish a second connection with recall. I couldn't believe how quickly she soaked up the information. To seal the deal, I'd tell her a bit of information about each place to help her retain knowledge. The stories definitely helped with recall. She could find Australia easily, for example, because she enjoyed the tale of the Great Barrier Reef- where all the Great White sharks live and where Nemo was released into the ocean. But more truth? There are a whole lotta countries I don't know much about at all! We began choosing one country each day and looked up Youtube videos to get a sample of what each place was really like. This was so interesting for BOTH of us, and we found ourselves getting really intrigued by new places. 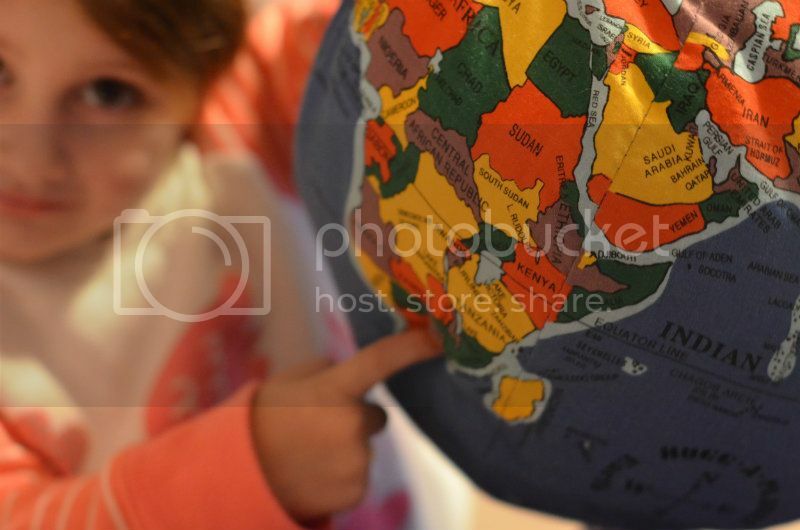 Soon, I brought out an old world map from my classroom and hung it on her playroom wall. Now we could practice locating countries away from her placemat. Again, I was stunned at how good recall was. By the time she was three, she could correctly locate over 40 countries around the world. As our child's knowledge grew, I realized that she was having trouble conceptualizing the roundness of the world. Since her maps were flat, she began asking why I'd say China was on the opposite side of the world. I knew I needed a round globe to help her see what I meant. I hopped on Amazon.com and ordered a Hugg-A-Planet pillow that is awesome! Now, she had an incredible, portable and snuggly visual aid that she could keep in her bedroom to play with and to learn more about geography. We love this pillow! Great score. Next I realized that, although this brainiac could point out Peru and Saudi Arabia with no problem, our next step was to learn about the ol' U.S of A! I started out by ordering a Melissa & Doug Deluxe Wooden USA Map Puzzle from Amazon and then set up a United States placemat next to her world mat. We'd play the Cheerio game on the placemat and put the puzzle together every day, talking about key features of the states as we learned. Again, we'd watch Youtube videos about places we found fascinating, observing Old Faithful erupt when Wyoming was discussed, checking out the Grand Canyon's aerial view when we learned about Arizona. You get the idea. Next, I ordered a Rand McNally US Wall Map from Amazon and added it to the playroom wall. I'd ask her to find California, where some of her aunties live- find Florida, where the alligators hang out- find Louisiana, where The Princess and the Frog takes place. Our geographer would hop back and forth pointing out the locations as we'd play. Freakin' AWESOME! My husband also brought home a large map so our kids can check out our home state as well. Soon, I stopped verbally asking her to, "Find Arkansas. Find Indonesia." Instead, I tried pointing to each location myself and asked her to say the name of the country or state. This requires a deeper level of thinking and recall, and again, I was floored by how easily she correctly responded. 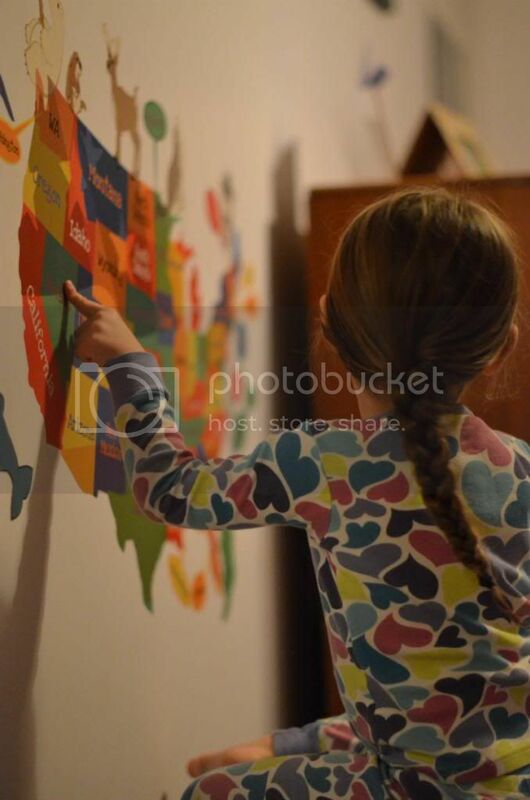 Adding a wall decal helps kids locate US states in their own space. Hearing about the geography craze in our house, a friend of mine gave our daughter a U.S.A. wall map. The decal is removable when you wish, so there's no need to worry about ruining the paint on your walls. Super cool! Teaching geography has been a wonderful learning experience for everyone in our house! The way our daughter has picked up this information has really shown me what an incredible capacity a kiddo's brain has for learning when you make fun activities out of the lessons. What's that about? I wonder. Know any cool tools or tricks for enriching learning geography? We're always down to learn more! Send us ideas! What a wonderful world! Let's learn all about it! I love it!!!! I'm going to go search for some maps to make place mats out of right now! You are the best mama-teacher ever!